Listening to the stallholders in Columbia Rd Flower Market crying their wares strikes a poignant note for me. 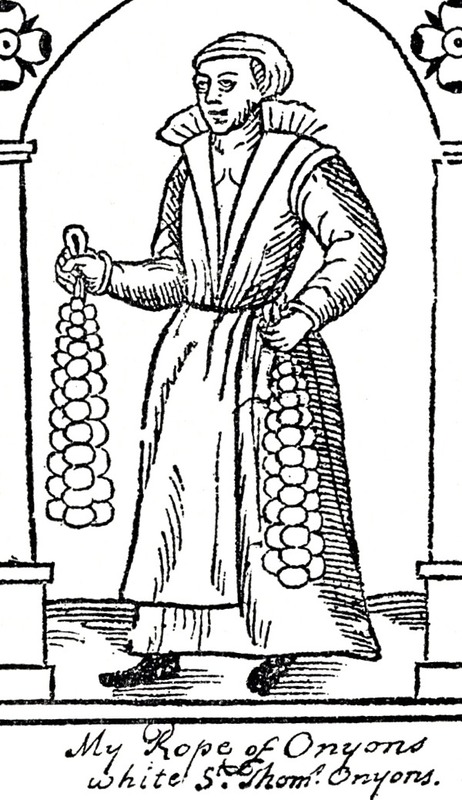 It is the last gasp of a centuries-old sales technique that is still in use in much of the rest of the world, reminding us that most goods and services used to be sold here by hawkers walking the streets. These days in London, it is only in markets where traders catch the attention of buyers in this way. 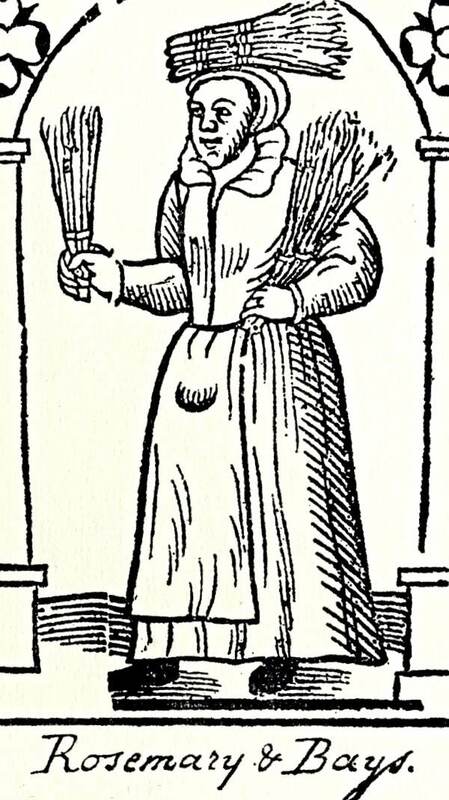 The Cries themselves, often simple rhymes or short bursts of song, are the equivalent of advertising jingles performed to a live audience. 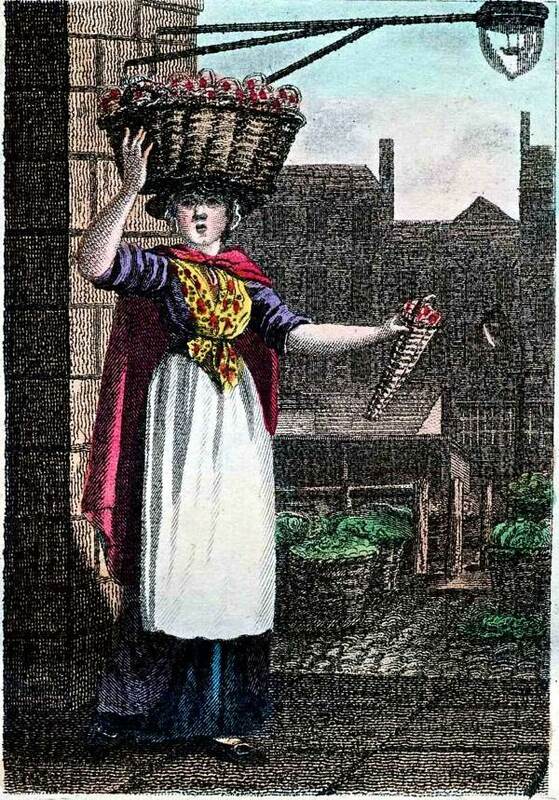 They are first documented in England by John Lydgate, the fourteenth century poet, although they do not appear in printed form in England until the early seventeenth century when they became popular subjects for a new genre of broadsheet. 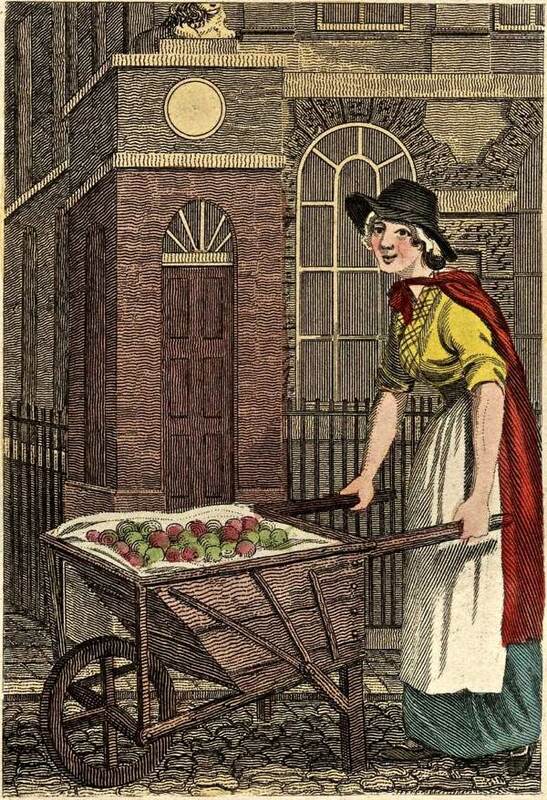 It was the beginning of a tradition that evolved from prints into children’s books, even printed on cigarette cards and lasting well into the last century. 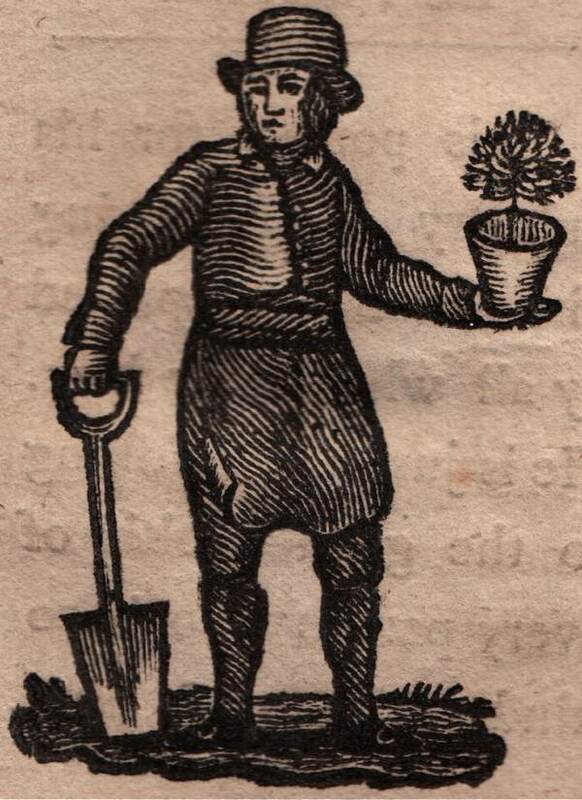 Images like that of “John Honeysuckle, the industrious gardener” give an insight into how gardeners and gardening were perceived. 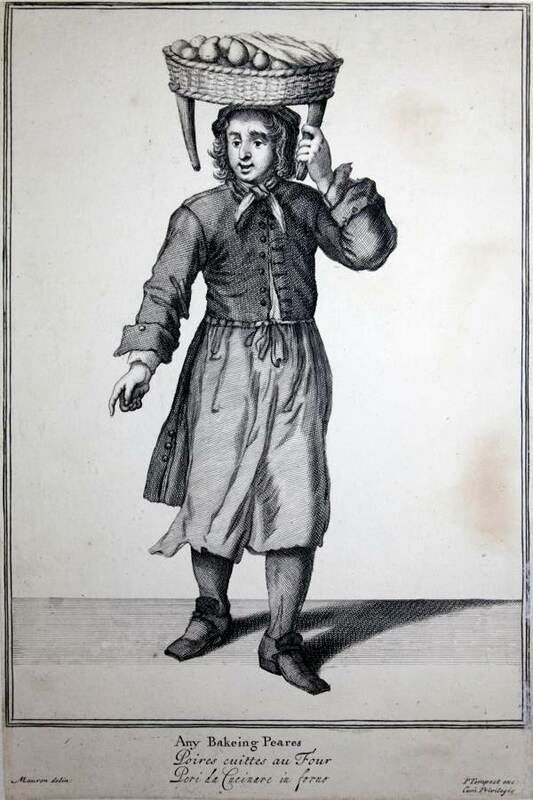 He is described as “with a myrtle in his hand, the produce of his garden. 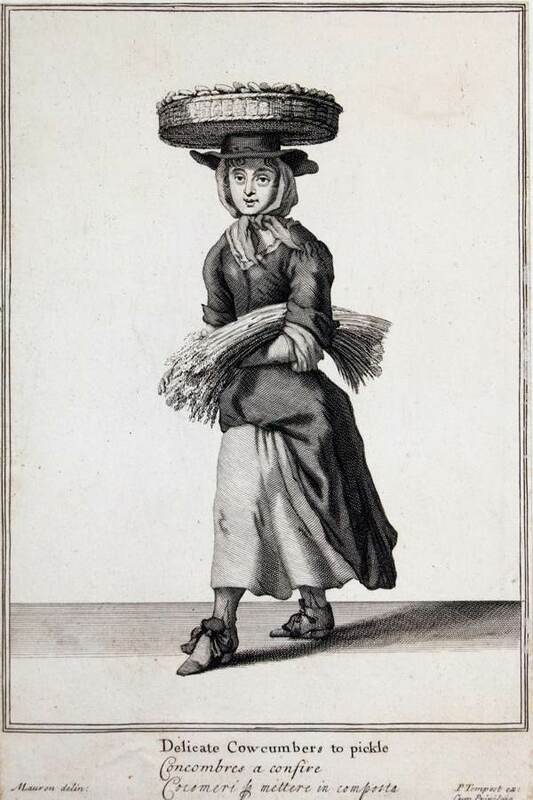 He is justly celebrated for his beautiful bowpots and nosegays all round the country.” Other images show the range of foodstuffs and flowers available, and the ways in which they were sold. 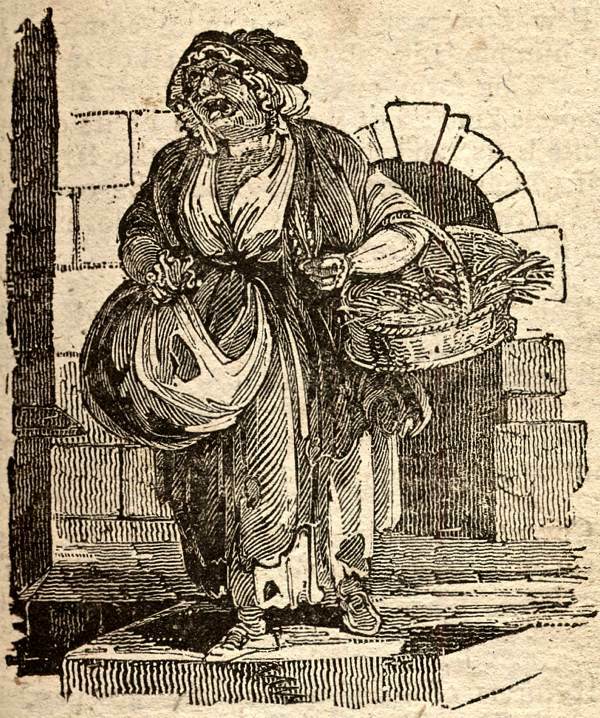 Printed street Cries were generally small in scale productions, making them cheap to collect, and their low price gave them the widest appeal. 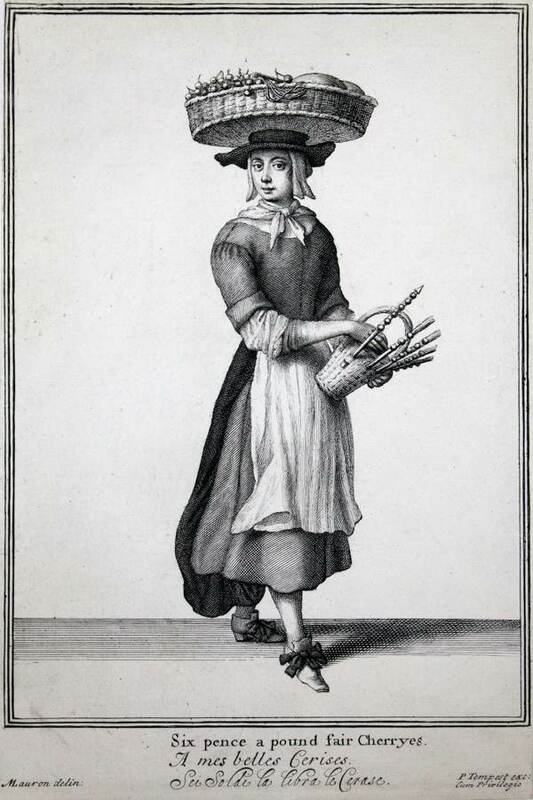 Samuel Pepys was a collector of books and topographic prints, but he also collected popular images of hawkers and street vendors. 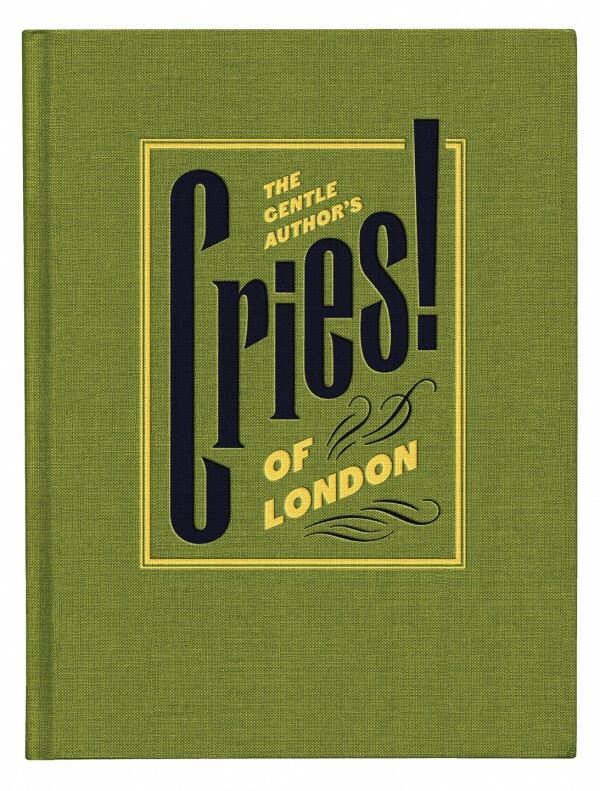 His library contained a file labelled “Cryes consisting of Several Setts thereof, Antient & Moderne: with the differ Stiles us’d therein by the Cryers” where he had three different sets of the Cries of London, together with two sets of Cries from Bologna, and others from Paris and Rome. His collection is the only surviving contemporary visual record of the street life of these places. 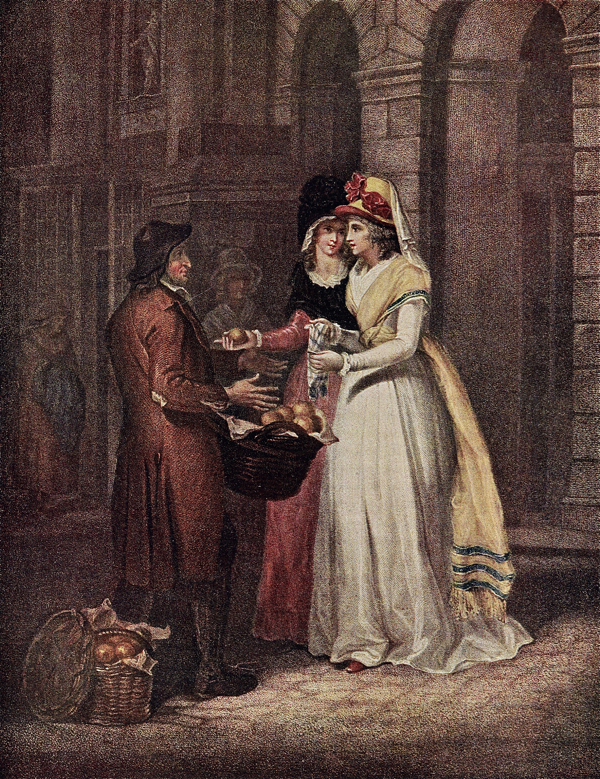 What these street Cries also reflect is the increase in availability of goods and how, by the last part of the sixteenth century, fruit like oranges and lemons, which were once luxury imports, had become commonplace – moving from expensive shops in the Royal Exchange to markets with open stalls and then to itinerant street traders. 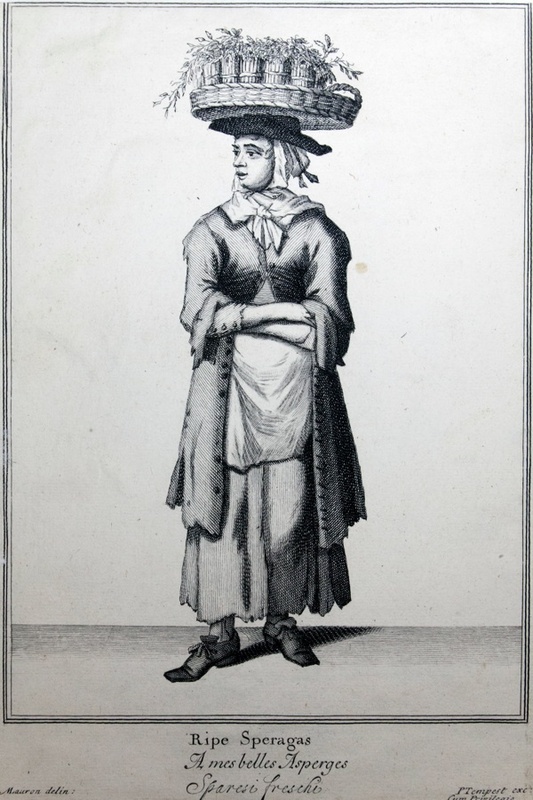 By the mid-eighteenth Dr Johnson was able to write ”The attention of a newcomer is generally first struck by the multiplicity of Cries that stun him in the streets, and the variety of merchandize and manufactures which the shopkeepers expose on every hand…” On the trades of London, The Adventurer, 27th June 1753. Asparagus became affordable, although as Marcellus Laroon reveals this was not the soft juicy young shoots we expect but rather overgrown and stringy ones, probably the leftovers from those available to the better-off. Whilst strawberries and cherries were seasonally popular and are the most commonly recorded, oranges and lemon are regularly shown too. 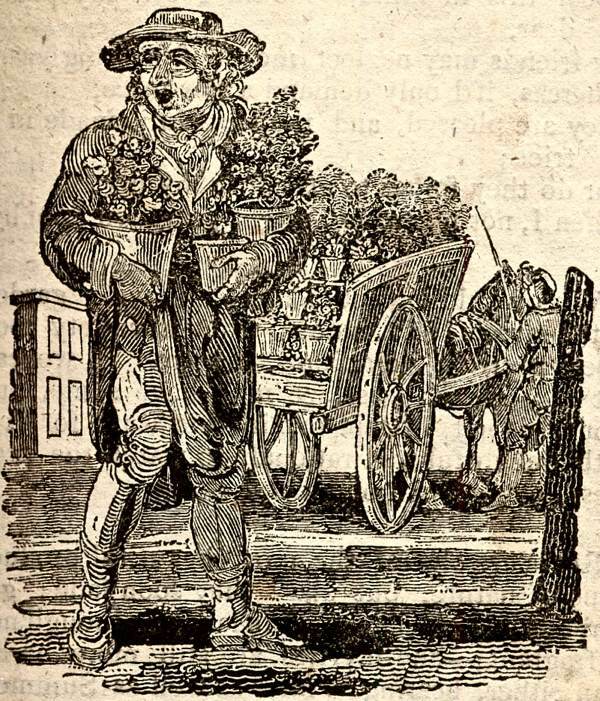 Images of working gardeners selling plants are much less common and tend to be much later in period than those of street hawkers selling basic foodstuffs. It is obviously difficult to assess the accuracy of the images of the plants they are selling: tulips in bloom, an orange tree, what looks like ivy on a small trellis and a miniature conifer. But taken collectively they do give an indication of the range of plants available for both indoors and outdoors. 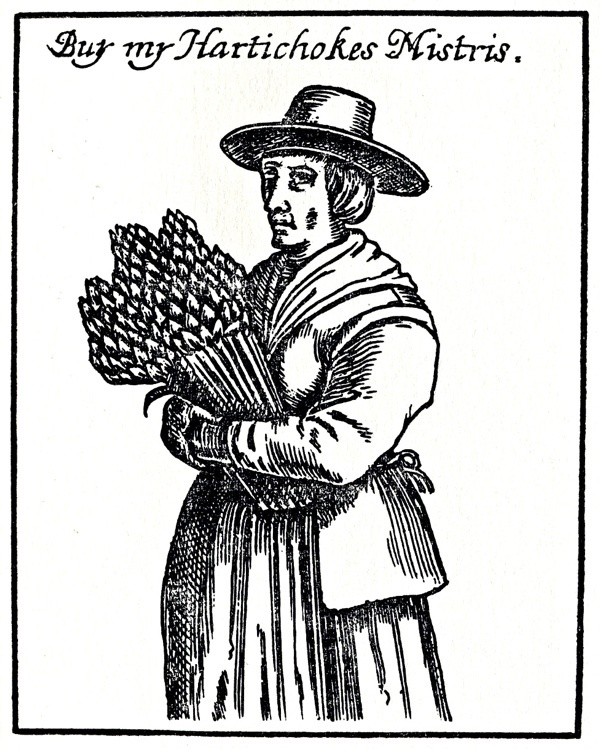 What is perhaps surprising is that street hawkers were also able to sell one of the ultimate non-essential goods, cut flowers. 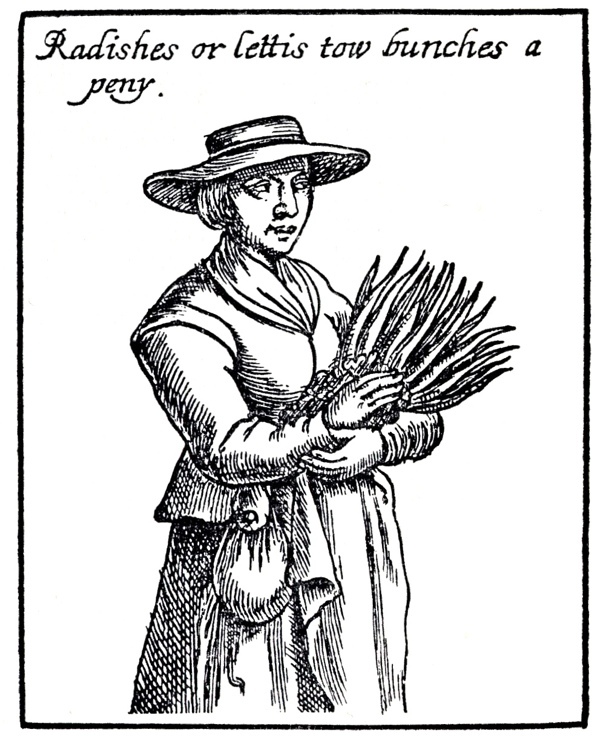 There was clearly a limited range at the cheap end of the market and, while we know that nurserymen were growing roses and other ornamentals for the cut-flower market, what appears in the Cries are those that could be picked in the hedgerows. While some lavender or rosemary have several uses, such as perfuming clothes or masking less pleasant smells others, primroses or sweetbriar, were bought simply because they were pretty and would bring joy to the buyer. Whereas most of the cries depict generic types, some are known to depict individuals. 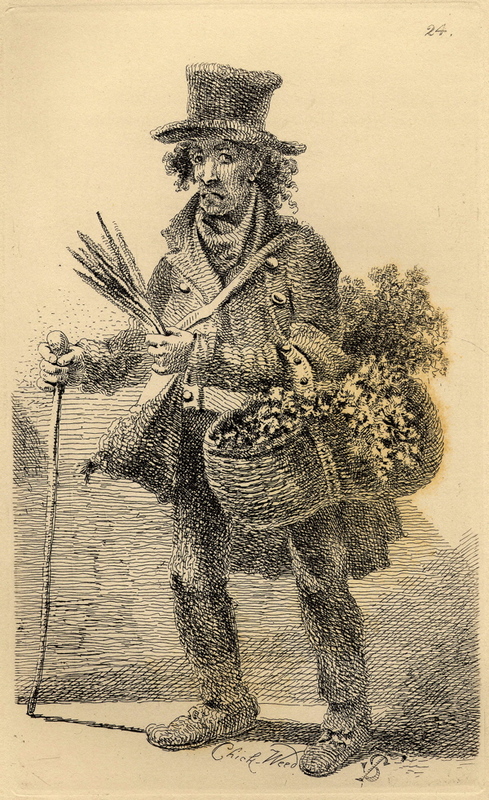 Anthony Antonini (illustrated below by John Thomas Smith) was an Italian immigrant, from Lucca, one of many driven abroad by poor economic conditions after the Napoleonic Wars. 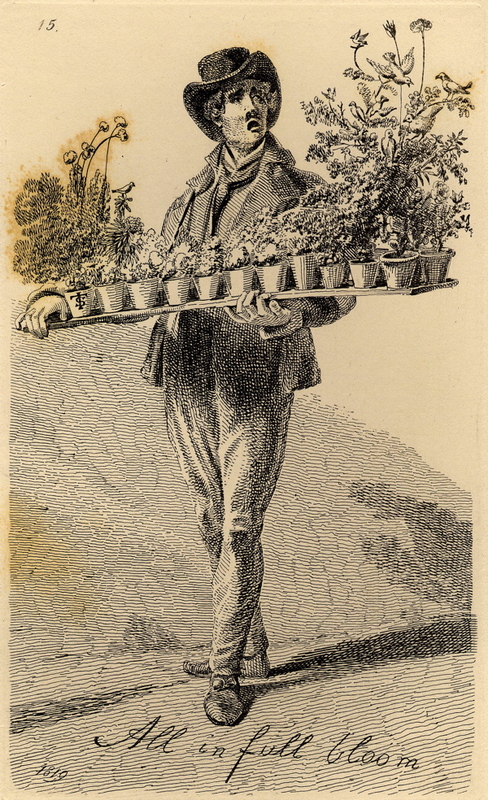 He is shown with a tray of potted plants and flowers. But, unlike John Honeysuckle’s plants, Anthony Antonini’s are artificial with wax birds perched amongst them. His goods would almost certainly have been made at home by his family, including his children. Cries vary in quality of imagery and detail but the poses and costumes remain much the same. What emerges over time is the change in the underlying attitude of the artists to those they were portraying. 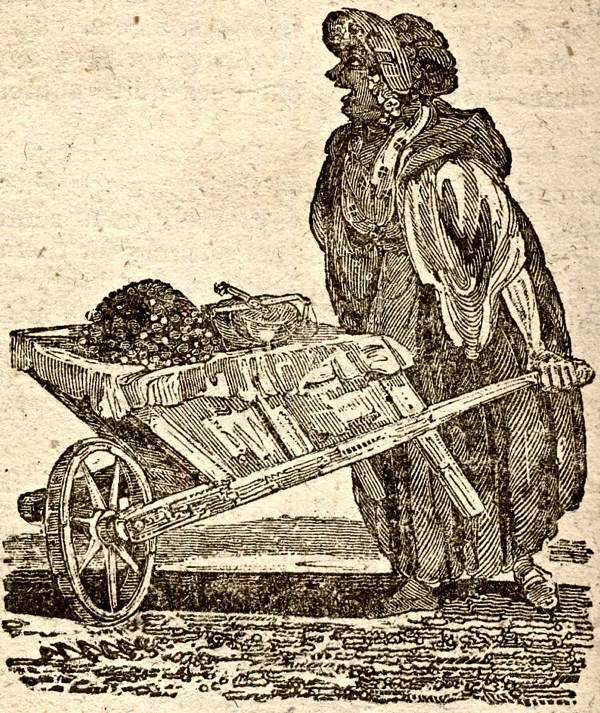 In the early cries, the hawkers and sellers are usually portrayed as respectable working people, reasonably dressed with little sign of drudgery or hard work. Thereafter there is a division between images that show something of the reality of street life which have the feel of being based on real people and those that sentimentalize or romanticize their subjects. 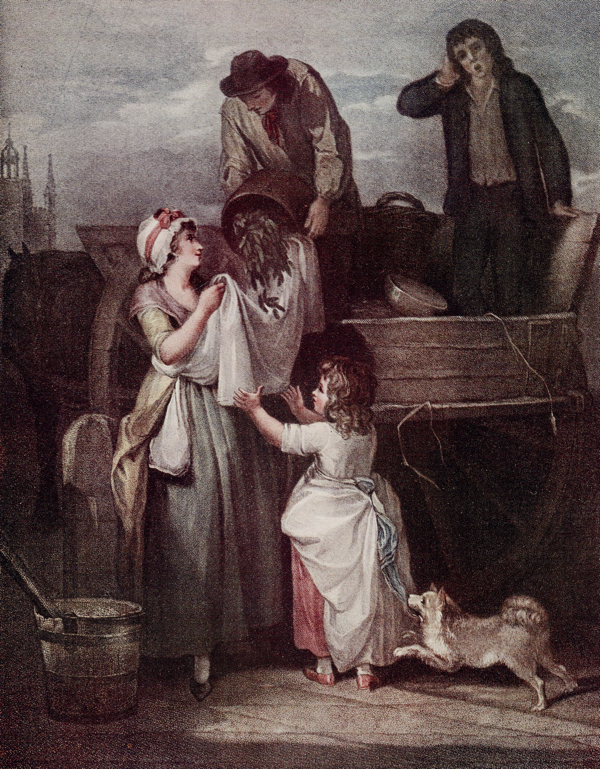 The Cries of London have gradually disappeared from our streets. Their numbers declined after the First World war and although some – like flower girls – survived until comparatively recently, in the twentieth century there was an element of nostalgia in the images. 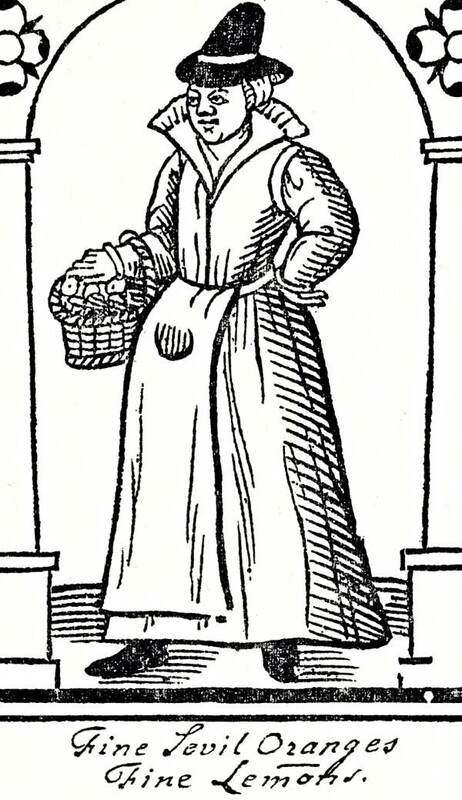 Yet the reality was markedly different for these workers, enduring extremely hard and difficult lives with little romance. Thank you for leading me on an interesting meander. Absolutely fascinating as a follow on to GA’S wonderful book which I already own. 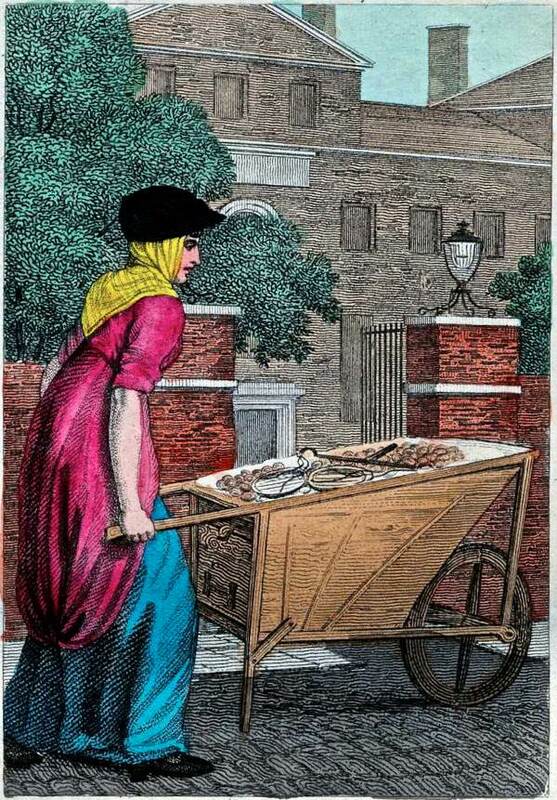 I have special interest in this subject as family history research has revealed that many of my ancestors were ‘Hawkers’ living in Bethnal Green in the mid to late 1800′s. 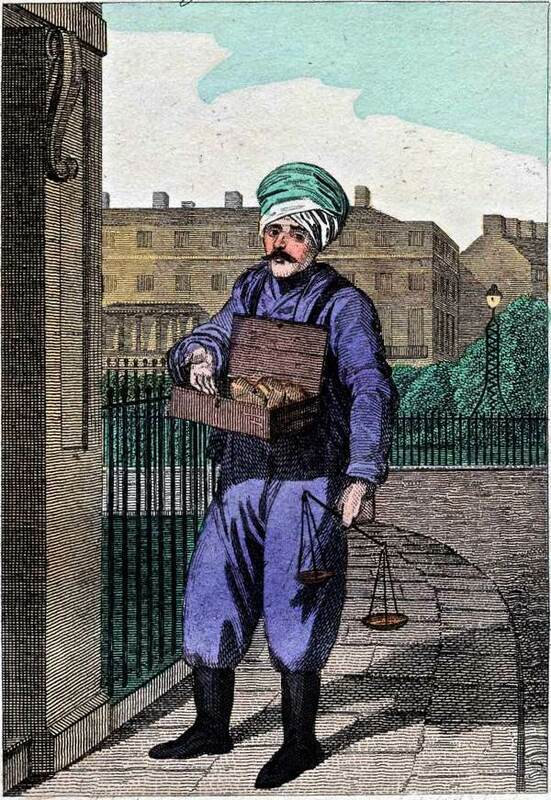 I am in no doubt that given their addresses at the time …..they would look like those street vendors portrayed by Luke Clennell. …….and described by the GA as ‘a rough bunch ‘ with ‘unrivalled spirit’. I am proud of them and their resourcefulness, struggling to do whatever they could to survive in such difficult times. A wonderful collaboration – great to see these images and stories brought together. 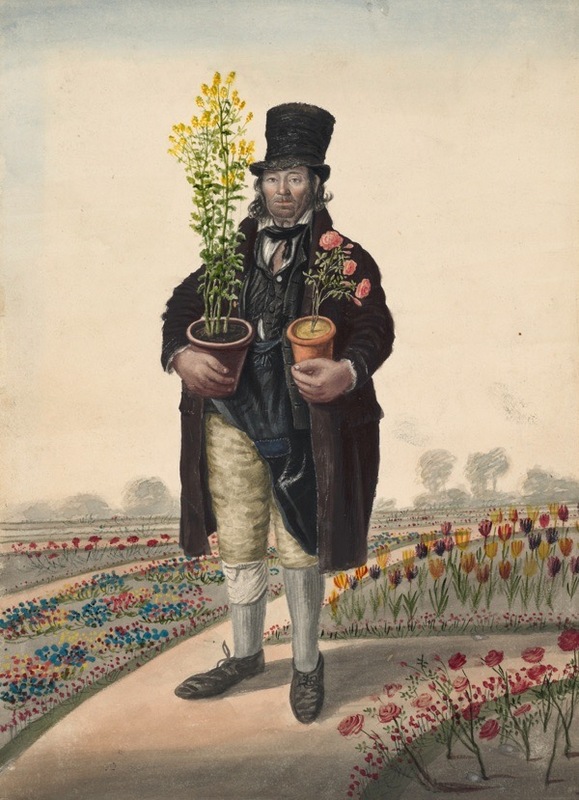 Fascinating record of how people have made a living in horticulture – and how the public purchased plants for their houses and gardens before the convenience of the garden centre and internet. 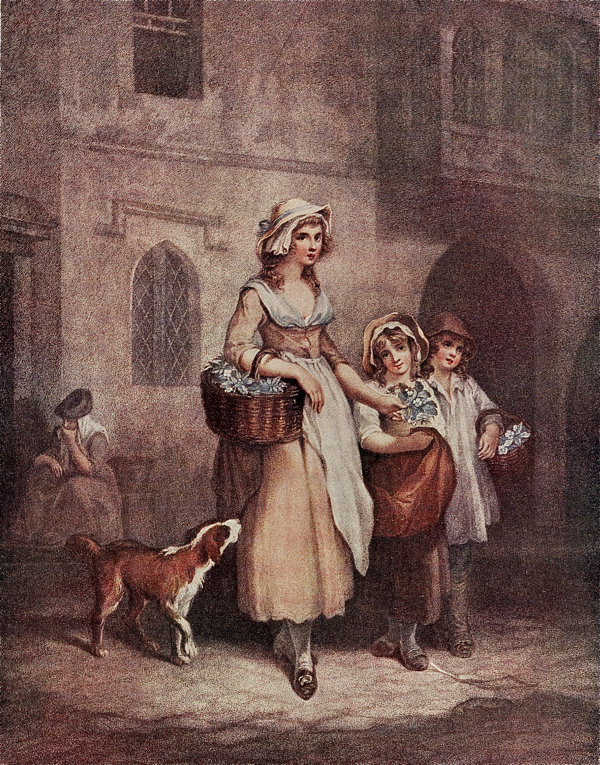 Yardley and Co. used the illustration of the the lavender sellers in their adverts for years. Two LPs/CDs you should know about if you don’t already. This is a CD release from about 10 years ago with early 17th century musical illustrations of cries by Orlando Gibbons, Thomas Weelkes and others. Marvelous contemporary interpretation/composition of cries performed by the second iteration of the Swingle Singers, Swingle ll. This is an LP release from the mid seventies, possibly with a CD reissue.